Documentary filmmaker and health expert Gary Null, Ph.D., shows footage that has not been seen from around the world, especially in Africa, in his new film. This is the first film on AIDS to bring together the most compelling arguments of dissident scientists, physicians and public health advocates. 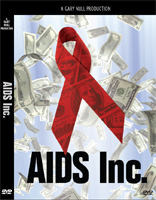 In AIDS INC., Dr. Null shows how greed and corruption have prevented any real progress in fighting the epidemic and its underlying causes. The film challenges the notion that AIDS or HIV is an African monkey virus that is spread sexually and can be "treated" with harmful drugs. It considers the common underlying conditions of the epidemic, such as malnutrition, unclean water, poverty, illness such as TB, malaria and dysentery, and poor lifestyle choices.